You've come to the right place if you need information about growing cucumbers. They are easy to plant, easy to care for and easy to harvest. Cucumber plants usually require very little maintenance and are one of the easiest plants to grow organically. Additionally, they thrive in the heat of summer. Cucumbers can easily be grown in both traditional vegetable gardens and in containers. As long as you keep them healthy, watered and picked, a typical cucumber plant will continue to produce fruit for several weeks. Vining varieties can be trained to climb a fence or trellis, which can save garden space and makes it easier when it comes time to pick the cukes. Cucumbers thrive in most types of soil and they require 6-8 hours of direct sunlight per day for maximum yield. They are typically planted a couple of weeks after the last expected frost and are harvested during the summer months. They grow best when daytime high temperatures are 70-95 degrees F.
There are several different varieties of cucumbers available to the backyard vegetable gardener. These varieties vary by color, size, shape and appropriate uses. Cucumbers are a refreshing summer treat. They are great in salads, soups and dips, along with being a key ingredient in tzatziki sauce. 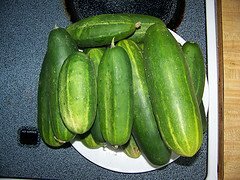 Many folks who grow cucumbers use them to make homemade pickles. 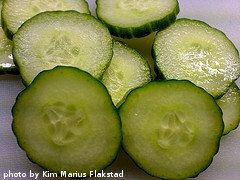 Cucumbers have a very high water content and they are very low in calories. If you pick them while they're young, cucumbers can add a nice crunch to a variety of dishes. Depending on the growing method, cucumber plants are suitable for any sized garden. They can take up as little or as much space as you want them to. Cucumbers can also be easily grown in containers, and there are several "space saver" varieties available. Because they are so easy to grow, cucumbers are a great way to introduce children to vegetable gardening. Several different bush varieties are available for those folks with limited space. Click on the following links for more information about cucumbers.